Introducing OKAJIMA A series of formal, casual and party bags and other fashion items produced using the Kyo Yuzen technique. 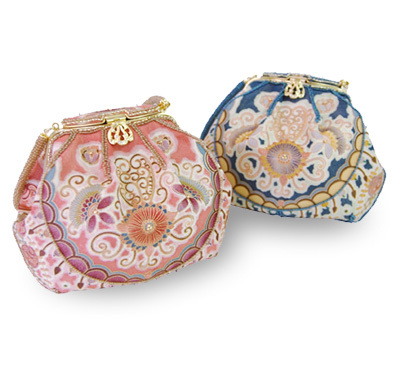 Bags and accessaries are made of high-quality silk. 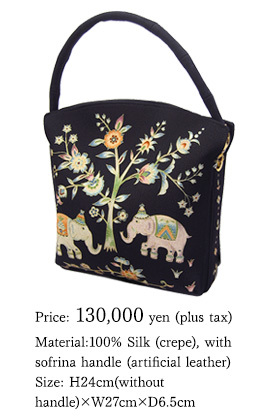 Silk materials are painted and dyed by hand in Kyo Yuzen style. Kyo Yuzen, completed in the 17th century, was developed in Kyoto, which has been the center of Japanese culture and arts since ancient times. Characteristics of Kyo Yuzen are the use of nature motifs, fantastical and delicate designs and gorgeous colouring. 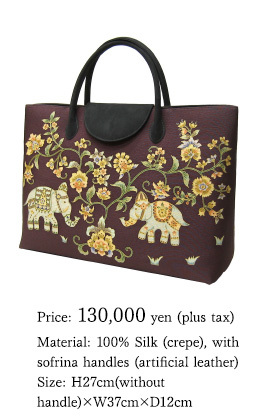 The OKAJIMA brand features exclusive creations in which refined style is instilled in silk arts. All OKAJIMA products are made by hand, so each one is unique. Each product is truly a gem. After the bag shape is decided, a paper pattern is made, and then the design is added to the pattern. The bag material is processed through more than 30 procedures such as brush dyeing, resist dyeing, colouring and steaming, before it is hand-sewn. Nagahama chirimen (crepe) is used for the surface, and sofrina for the handle. Sofrina is a light, soft and supple leather. Being both water and stain repellent, it is a practical material for bags. Chintz patterns with nature motifs are appreciated in both Western and Eastern cultures. 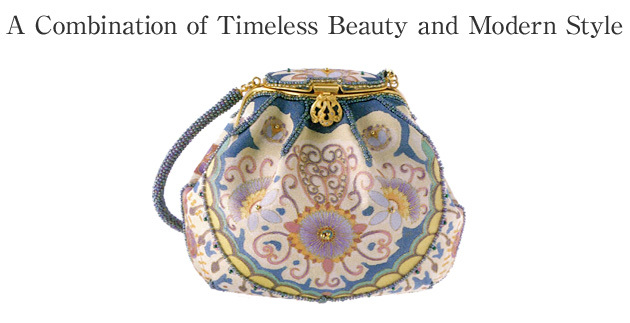 Gorgeous and delicate designs are made possible by a combination of such valued patterns and Kyo Yuzen technique. They are light and handy with good storage. Water-repellent finishing is done for everyday protection. Please allow three months, as the whole process is done by hand. An incomparable creation made of nashiji satin silk, which is hand-painted and dyed by artisans using more than 30 different processes. Its body is shaped into a cube as it is decorated with beads. The chintz pattern with a nature-inspired motif is timeless and will always compliment any age or style. The bag's mouth may seem small, but it actually has a conveniently wide opening. 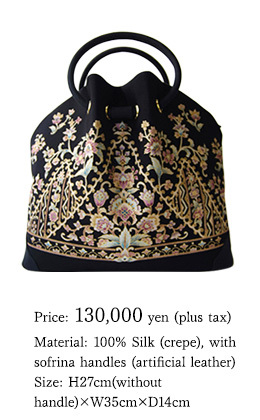 Its fantastical and delicate appearance has a gorgeous soft air with beaded decoration, which is suitable for both Japanese and Western outfits. 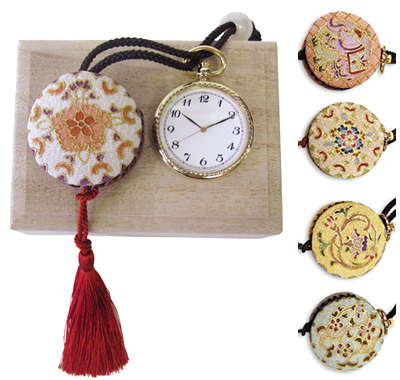 An OKAJIMA company original, the decoration is done by hand-painted Yuzen. It is also suitable for conventional mobile phones and digital cameras. 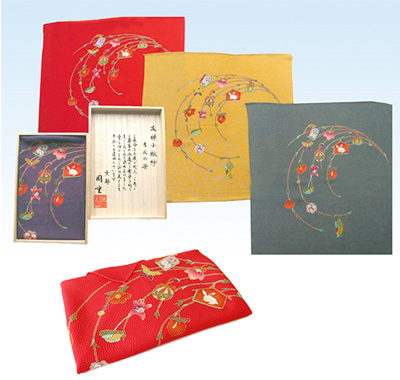 Kobukusa is a wrapping cloth that is traditionally used for folding a gift-money envelope, but recently it has become more versatile. It is regarded that wrapping things carefully in a cloth indicates the person's attentiveness towards handling them. Drawn in the centre of the fukusa is a charm laden bamboo stalk that has just come into bud. Being evergreen with evenly-spread knobs, bamboo is considered to be a symbol of well-being. Hanging from the bamboo are craftwork charms consisting of pouches, books, frogs and votive pictures, which appeal to the gods to bring you good luck. Available in 4 colours. Superb item for yourself, as well as for gifts. 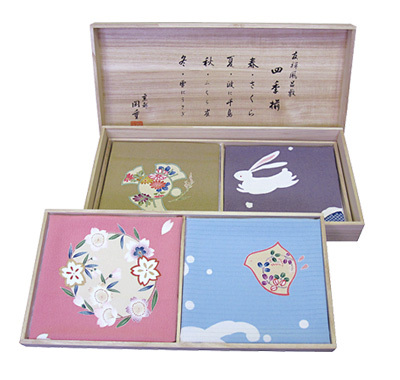 It is a noteworthy Japanese custom to enclose one's feeling in a gift by paying attention to its wrapping. 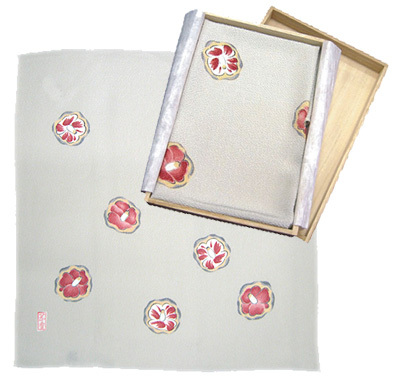 Blooming on this wrapping cloth are graceful camellia flowers by Japanese painter Kiyokata Kaburaki. These flowers are reproductions of haura patterns used in early 1900s. The dark red colour of the flowers produces a warm, soft appearance, embodying the camellia's symbolic meaning of the coming of the delightful spring season. An excellent item for thank-you gifts. 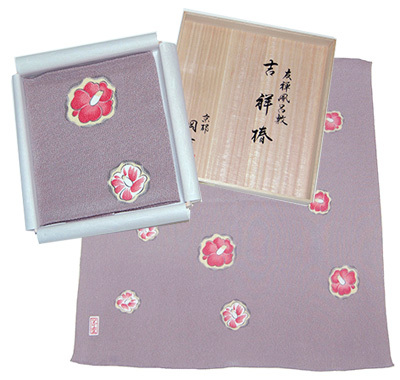 A set of four high-quality, crepe wrapping cloths dyed in Kyo Yuzen style. Each cloth is themed after a different season. Combining two contrastive elements of bold composition and delicate seasonal motifs gives a graceful impression when both wrapped or unfolded. In addition to designs appropriate to each season, the summer cloth is made of silk gauze for a refreshing, cool feel. Available as a set of four enclosed in one paulownia box or with each individually enclosed in it’s own paulownia box. Kosode-kimono patterns are revived from the Edo period to grace this set of wrapping cloths. 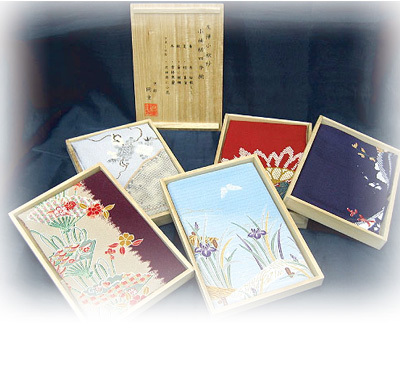 Carefully selected patterns depicting the four seasons are copied elaborately on to the crepe cloths using the stencil Yuzen dyeing technique. Their sophisticated, graceful patterns convey the stylish sense of beauty in Japanese kimono culture. They are useful items that can be chosen according to the season and occasion. 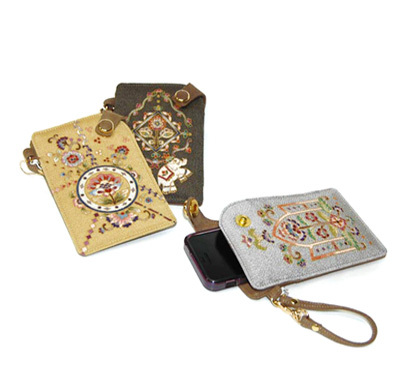 The case is covered with a hand-painted Yuzen fabric. The dial of the watch is big and easy-to-see. 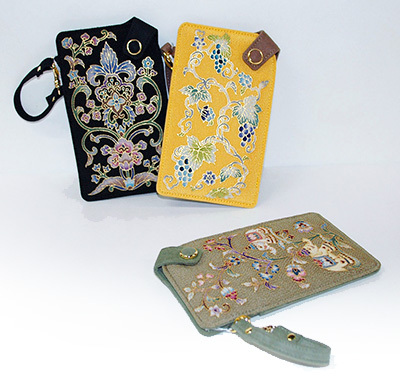 An excellent item for a kimono or bag accessory. 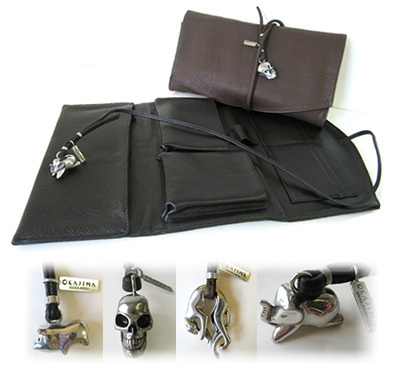 A new item from the OKAJIMA brand, this pouch is designed for men and has four different strap charms to choose from. copyright(c)okaju co.,ltd. All Right Reserved.